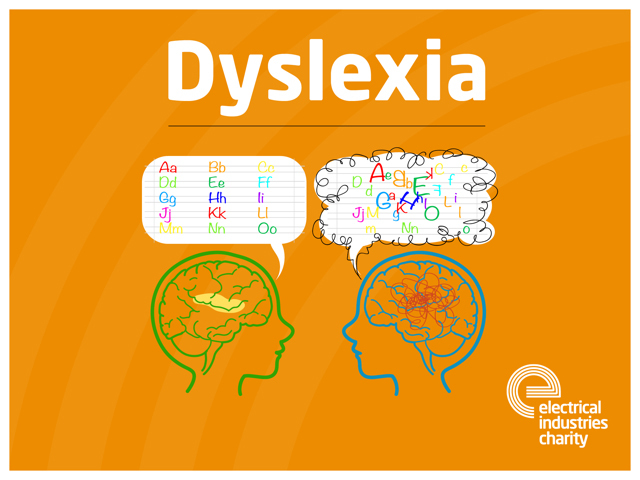 Almost 15% of young adults in the electrical industry are dealing with learning difficulties such as dyslexia and through its Apprentice Support Programme, the Electrical Industries Charity is providing vital support to ensure these young people succeed in their chosen career. Dyslexia is a hidden problem that can be missed at schools, and often shows its presence through disruptive behaviour and missed schooling. For example, at the age of 15, Scott left school, due to many years of bullying and missed education. He is now well on the way to completing his apprenticeship, and all of his work is well documented. However, he has yet to pass his final written exam, and it is now that his difficulties have come to light. After years of ongoing bullying at school for being ‘stupid’ Scott almost quit his apprenticeship thinking that his dyslexia was an intelligence issue. His employer was keen to help him through this final stage of his apprenticeship and, therefore, he approached the Electrical Industries Charity to get more support for Scott. The Electrical Industries Charity joined ties with JTL to facilitate Scott’s first ever assessment for dyslexia and found a specialist tutor to help him on a one-to-one basis. Scott will now be supported right through his exam, and on to a successful journey as a fully qualified electrician. In the electrical sector, there are many young apprentices like Scott who are not aware of their learning difficulty, which can stand in the way of pursuing their dream career. By joining together, the Electrical Industries Charity and JTL are helping young apprentices to succeed in their chosen careers and aim to end the stigma of mental health issues while creating awareness and giving them the support they need.